Start with one piece of paper. Fold it in half, then open it back up. Fold each side to the center line and crease well. Fold the bottom left corner up and over to the right and crease it well. The edges should line up. Then, fold the top right corner over to the left and crease it well. Turn the paper so the points face up and down. Fold the top corner down and crease. Fold the bottom corner up and crease. If held down, your paper should look like a small square with a diagonal line dividing it in half. When you let go the flaps will pop back up, and that’s okay. Do steps 1-7 with the other five pieces of paper. To fit the pieces together, slide the end flap of one piece into the center fold of another. Then, do this with a third piece of paper. 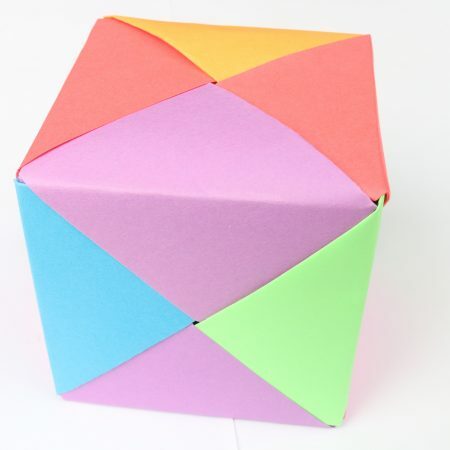 Continue adding paper sections until all six pieces are tucked into each other to create a cube. Watch Rachel, a Paper for Water volunteer, create her own origami cube!